Flow East celebrated the culmination of its successful Art Hub project, a free studio and exhibition space for artists living and working in Prague, with a final exhibition and reception on the evening of Thursday, March 9. 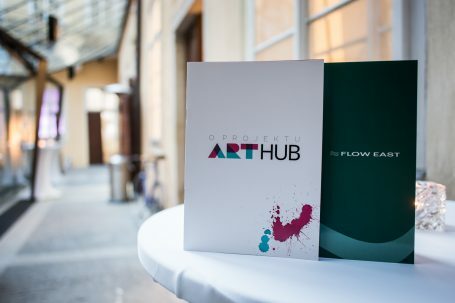 Art Hub, established in 2015 by the company at its 12th century building in downtown Prague called Ericsson Palace in Malé náměstí, has provided free studio and exhibition space for nine young, aspiring artists that were chosen from more than 50 applicants by a committee led by the chief curator of the National Gallery, Adam Budak. “Art Hub was a unique project that has no precedent in the Czech Republic and there is a need for such visionary projects so that local art can survive,” said David Krňanský, one of the ‘Artists in Residence’. The other Art Hub ‘Artists in Residence’ were: Antonín Jirát, David Krňanský, Kateřina Holá, Ladislav Vondrák, Markéta Adamcová, Martin Lukáč, Petra Křivová, and Rudolf Samohejl. Established as part of Flow East’s 25th anniversary celebrations, Art Hub gave space to the nine artists for 16 months of intensive work, during which about 1,170 paintings, sculptures and other artworks were created. The reception featured an exhibition of a selection of that work completed by the resident artists, followed by drinks and canapés. The Art Hub project follows a series of public tours by Flow East of the historically-important buildings in its portfolio; an exhibition titled “Wenceslas Square – The Focus of Change”, the aim of which was to raise public awareness about the unique history of the most famous square in the Czech Republic; and a competition for local artists to design the missing statue on the “Císařské schodiště” (Imperial Staircase) in its Forum building at Wenceslas Square #19. For more information about the project, please visit the website www.arthub.cz.